As the digital economy takes shape, more and more people and businesses around the world are going online. The number of internet users in China reached around 804.5 million in 2018. This has driven the explosive growth of the Chinese e-commerce market, which is currently a global leader. The number of online shoppers in China increased from around 46 million in 2007 to over 533 million in 2017, generating over one trillion yuan in online B2C retail revenue quarterly. 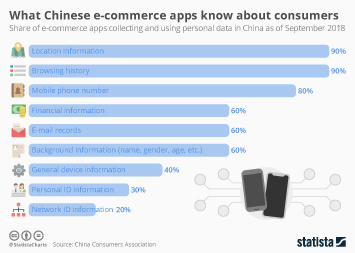 Increasing popularity of e-commerce among Chinese consumers is likely related to the growing number of e-commerce platforms and apps, convenience, accessibility, and extremely user-friendly digital payment options. As of 2017, around half of the population were using e-wallet for payments, Alibaba’s Alipay leading in the electronic payment front. As of 2018, multinational conglomerate Alibaba.com is the most successful e-commerce company in China. Alibaba dominates the B2B market and it’s Tmall and Taobao websites also enjoy the biggest market share of the B2C and C2C markets respectively. More interesting topics from the industry "E-Commerce"